A screen on the floor of the New York Stock Exchange shows the rate decision of the Federal Reserve, March 20, 2019. Combined, the moves signal no major increases in borrowing rates for consumers and businesses. And together with the Fed's dimmer forecast for economic growth this year — 2.1 percent, down from a previous projection of 2.3 percent — the statement it issued Wednesday after its latest policy meeting suggests that it's grown more concerned about the economy. Federal Reserve Chair Jerome Powell gathers his notes as he concludes his news conference in Washington, March 20, 2019. But after the December turmoil, the Fed in January began sending a more comforting message. At an economic conference soon after New Year's, Powell stressed that the Fed would be “flexible” and “patient” in raising rates — a word he and other policymakers have invoked repeatedly since — and “wouldn't hesitate” to change course if necessary. 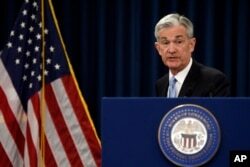 Powell, appearing last week on CBS's “60 Minutes,” denied that pressure from Trump had influenced the Fed's policy shift. Private economists generally agree that a slowing economy and a sinking stock market, which eased Fed worries about any possible stock bubble, were more decisive factors.